The bf and I were hungry on Election night and decided to try out an Italian restaurant called Red Tomato in Bethesda. The closest metro stop is Bethesda on the Red Line. The restaurant is up the street from Olazzo, so there is street parking, and a metered garage a few stores down from the restaurant. 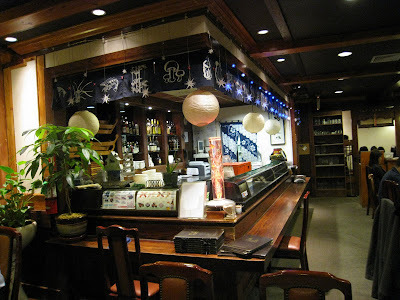 The interior had dim lighting, dark wood, and brightly tiled tables. The menu was a fair size with around 8 appetizers, salads or pastas to choose from, and around 15 brick-oven pizzas. We were given bread while we waited for our food to arrive. Unfortunately it tasted like store bought white bread with plain butter. For our appetizer we ordered the 'Calamari e Zuca Fritti con Pomodoro - Fried calamari and fried zucchini with spicy pomodoro sauce' for $8.95. I didn't really like the dish because it tasted frozen and the 'spicy' sauce resembled salsa. The bf and I decided to both order pizza since they are known for their brick oven pizzas. He ordered the 'Pollo con Pesto - Oven Roasted Breast of Chicken, Tomatoes, Caramelized Onions with Pesto and Mozzarella' for $9.95. I thought it was delicious. The chicken was well-seasoned, the thin crust was just thin enough, and the cheese tasted great. I ordered the 'Verdure - Mozzarella and Fresh Tomato Sauce, Eggplant, Caramelized Onions, Tomatoes and Portobello’s' for $9.95. I loved my pizza as well. The cheese really made the pizza for me. I'm not usually a crust eater, but I did eat them there. Very well seasoned over all too. The pizzas are well portioned for an individual to finish by themselves. For dessert we ordered cannoli that had chocolate syrup on them. I've had better only because the chocolate syrup tasted like it was from a Hershey's syrup bottle. I was slightly disappointed that evening when I really wanted to like it. I was recommended by a friend but I think the restaurant was having an off night due to the Elections. We were one of 2 couples there. The food besides the pizza was mediocre, the service was inattentive, servers were yelling at one another right next to us, and they were cleaning up to close early while we were there without a warning notice on the door. On a more positive note, if you want to go some where casual and cute then this place is for you. 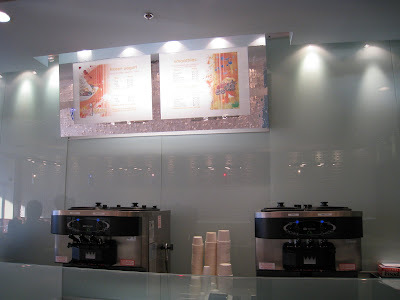 It has a nice ambiance, but uses paper napkins which make the feel less formal. The pizza was very good since the brick oven gives the pizza great depth of flavor. The prices are very reasonable, with the most expensive item being $16.95. Hey everyone! I'm heading out to sunny Phoenix, AZ and leaving cold MD behind for an entire week! I can't wait to see my family. I'll be on a plane Monday, but I'll have another restaurant review up this weekend before I'm gone. I'll also make sure to take lots of food pics (cuz we all love pictures of food) from the trip to show you all when I get back, including Thanksgiving food, Mexican, Tex Mex, and In-N-Out Burger. Why can't In-N-Out come to the East Coast? So not fair. 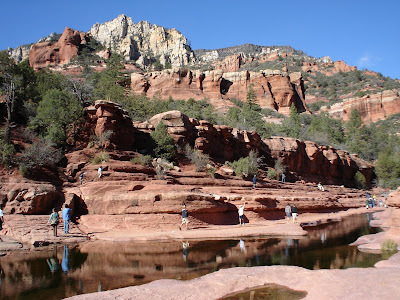 This is a pic from Sedona, AZ while I was there 2 years ago. Red rocks, canyons, etc. We don't have anything like it out here, so I'd highly recommend checking it out sometime in your life. 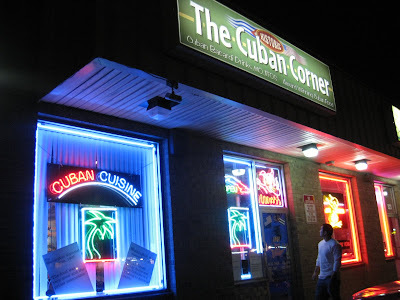 The bf and I went on a double date with some friends and checked out Cuban Corner in Rockville, MD. Its right up the street from Montgomery College in a little shopping strip, and the closest metro stop would be Rockville on the Red Line. You can't miss this place because of the neon signs on it (similar to my Yechon review), and there is plenty of free parking on the front and side. The space is very tiny. I think there were about 8 tables in there. This is a shot of 1/2 of the place already. It looks and feels like you're in some other world because the decor is hectic. This is the smaller side of the restaurant. The kitchen is right behind the wall on the right. There is always something to look at while you wait for you food, so its pretty entertaining. 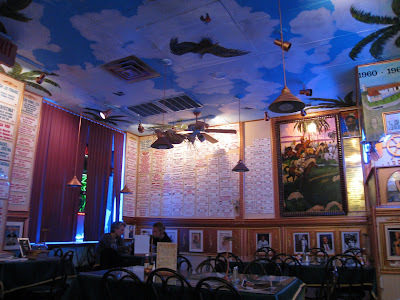 Even the ceiling is painted like the sky with birds flying around. Its not everyday you walk into a place that resembles a child's bedroom, but I thought it was cool. 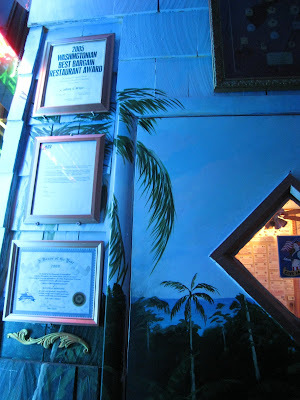 Along with the paintings, there were photographs of famous people that have stopped in to get some of their Cuban food. 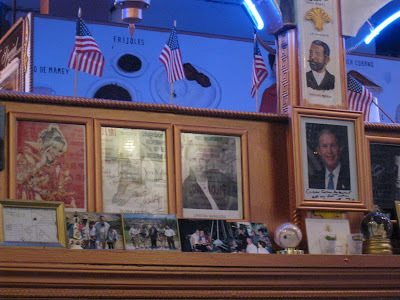 Some people that I recognized were Celia Cruz, Gloria Estefan, and President George W. Bush. 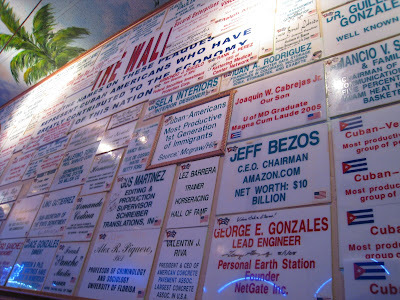 The largest things covering the walls were plastic plaques with the names of Cuban Americans who have contributed to the economy of the United States. Gotta love menus with pictures! 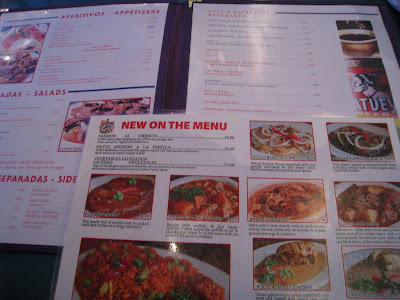 It was a pretty big menu with a lot of different items and drinks. 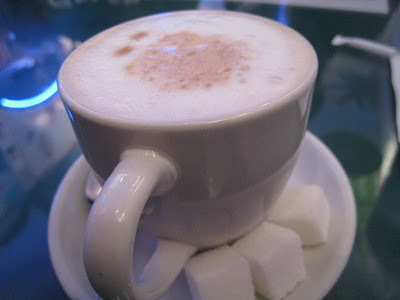 For a drink I ordered a 'Cortadito' which is strong Cuban Coffee with cream for $2.75. It's a very small cup with 3 lumps of sugar on the side. It was so good! I love my coffee strong. I put all the sugar in it, and it was perfect for me. I'll probably order it every time I go there. 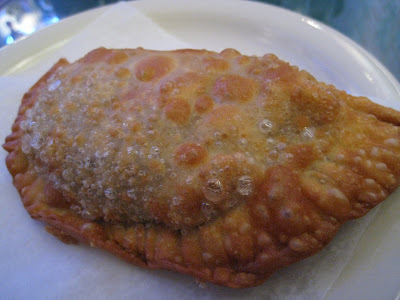 For my appetizer I ordered one beef empanada for $3.79. It tasted awesome! It was eally flavorful with a tender crust on the outside, slightly greasy though. I recommend this. My friends ordered a side of fries for $3.75. 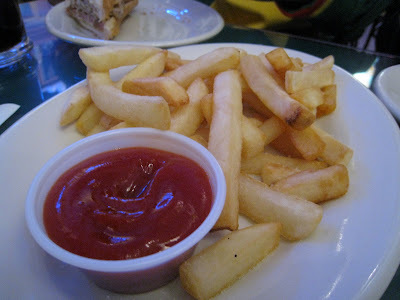 On the menu they are called 'Papas Fritas - Freedom Fries'. The bf ordered a side of black beans. I tried it and it was good, but nothing special. 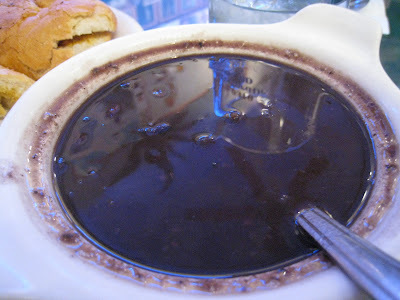 It was a bit bland, but it is supposed to counter act the saltiness from the pork and meats in Cuban dishes, so it does it's job. 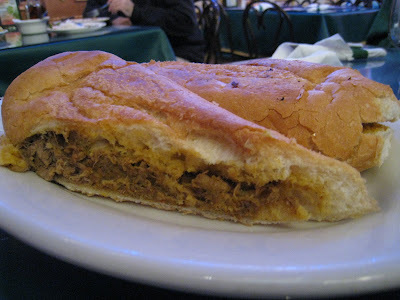 The bf ordered the, 'Pan Con Lechon Asado - Roasted Pork Submarine' which is marinated pork grilled with onions and mustard on toasted Cuban bread for $7.69. I tasted it and was flavorful. 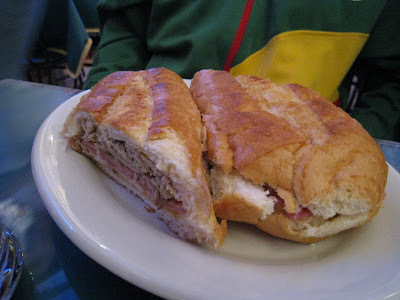 One of my friends ordered the 'Emparedado Cubano - Cuban Submarine' which is a warm, pressed sandwich of slices of roasted pork, Virginia ham, swiss cheese, mustard and pickles. 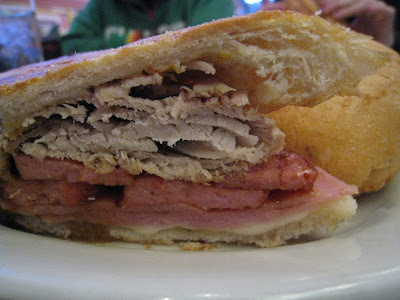 This is Cuban Corner's #1 seller! Like all but one other sandwich, it is $7.69. It is a good amount of food because you get 2 sandwiches halves on your plate. My other friend and I ordered the 'Emparedado Cubano Especial' which has all over the same ingredients as the sandwich above, but this one included chorizo (Spanish sauasage). This raised the price to $8.99. Yummy, I ate the whole thing. 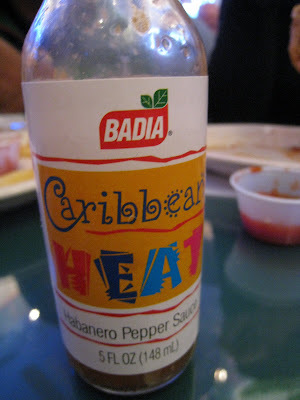 They had a hot sauce on the table called 'Caribbean Heat' that really helped bring out the flavors of the sandwiches. It wasn't overly spicy even though it had Habenero peppers in it, but gave a nice kick along with some moisture to the pork in my sandwich since it was a bit dry. Overall I liked this place because of the crazy decor, the super friendly and helpful staff (always a deal breaker for me), and the large menu. The food I had was good, and the prices are very fair. The most expensive item on the menu is a seafood dish for $16.29. 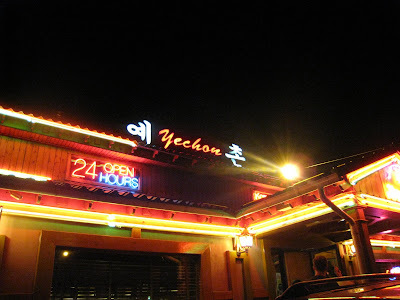 My friends and I stopped by Yechon in Annandale, VA for some late night Korean food since its one of the few 24 hour restaurants in the Northern VA area. The closest metro stop would be East Falls Church on the Orange line. 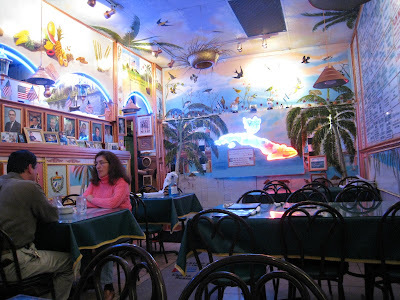 The restaurant is so bright, and is glowing with a bunch of neon signs, so it's hard to miss for the road. There is parking all around the place however it can get filled up pretty fast. There were a couple of awards on their walls from The Washington Post Magazine and AOL. 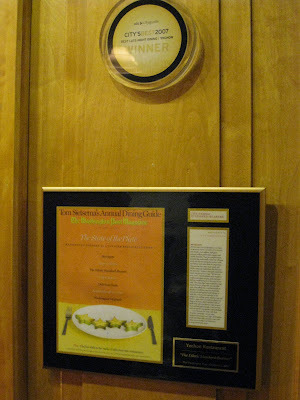 I always look for awards at restaurants because it means that the place is most likely good. The interior decor is made of of lots of wood. 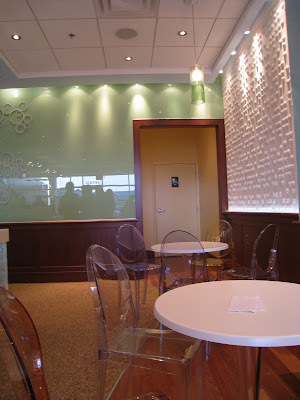 The lighting is bright, and clean with a sushi bar on one of side of the restaurant. We arrived around 1:30am and it was already packed! There are a lot of tables packed into a decent sized room. 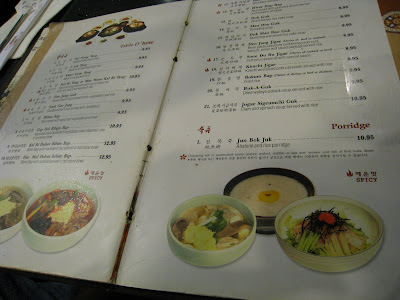 They have an extensive menu with Korean and Japanese food. I love menu's with pictures because if you can't decide what to eat by the descriptions, just point and order whatever looks delicious. Also while sitting there looking at the menu, the place smelled soooo good. Everyone else's food makes you even hungrier and more eager to start eating. 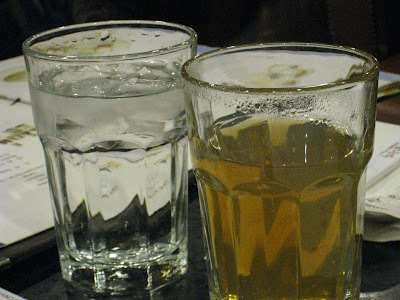 It was cold that night so we all got water and hot tea for free. The bf and another guy friend ordered some 'Soju'. 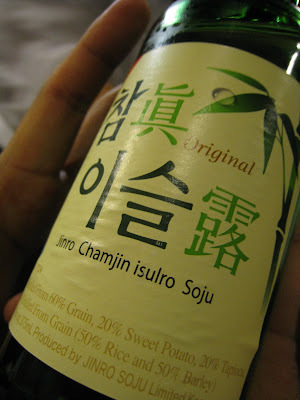 It is a Korean alcohol usually made from rice, barley, sweet potato, tapioca or other random things. Its a clear liquid that is taken in shots. 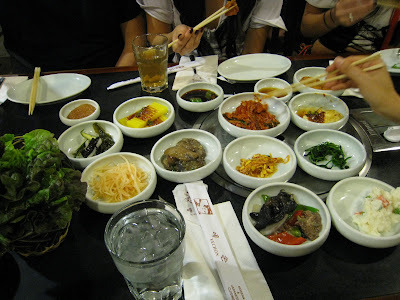 In Korean restaurants after you order your food they give you 'banchan', which are small appetizer/side dishes to eat while you wait and to eat with your entrees. This place is AWESOME and gives you around 15 different kinds. There was kim chi (fermented spicy cabbage), potato salad, bean sprouts, pickled vegetables, acorn jelly, etc. 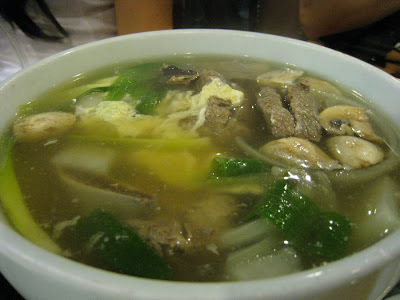 My friend ordered the 'Galbi Tang,' which is a beef rib soup with vegetables and duk (slightly chewy rice disks)'. It is a non-spicy dish. 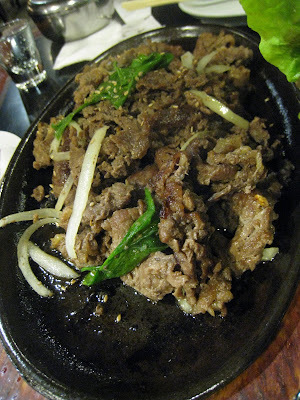 The boys ordered 'Bulgogi', which is seasoned, finely slices of beef. The tables are equipped with table grills, but they cooked it in the back and brought it out for us. I think it is because it's faster for them since it gets so crowded in there. 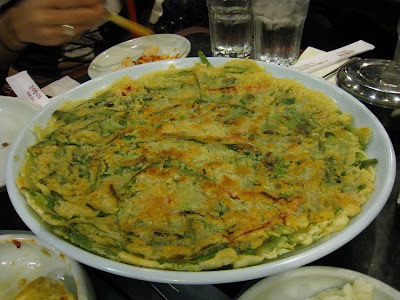 My cousin ordered 'Pa Jun' which is the "Korean Pancake". It's a flat, pan-fried dish made with flour, and vegetables. It was crispy, however I've had better. 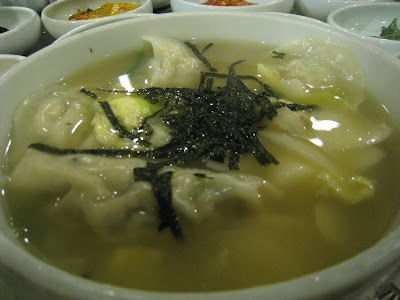 I ordered 'Mandoo Guk,' which is a beef dumpling and duk soup. It was really good, not spicy, and filling cuz the bowl was HUGE. Boys like to eat meat, so they ordered more! 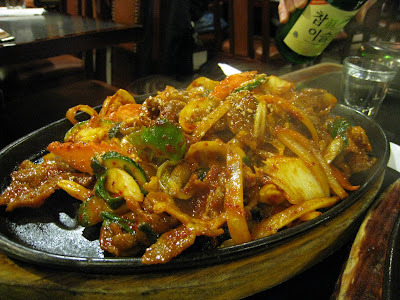 This time it was 'Jae Yook Bokum,' which was a spicy, smokey, dish of fried sliced pork with onions and other vegetables. It was really good and flavorful. My cousin also ordered some shrimp and vegetable tempura. 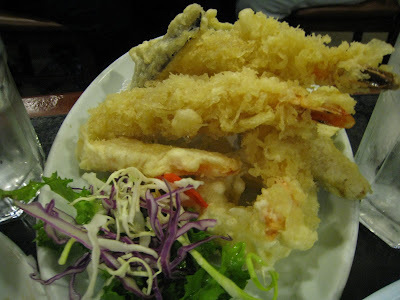 It is a dish where shrimp and vegetables are fried in a Japanese flour batter. As you can see the table was full of food! The restaurant is not that cheap. I apologize for not having prices but it was late at night! 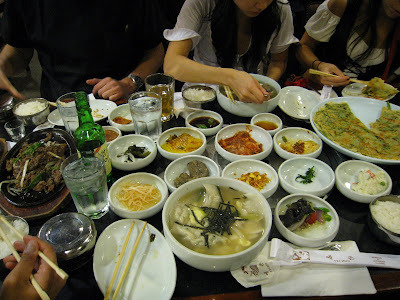 Korean Barbecued dishes can run around $18 and the soups were around $10. 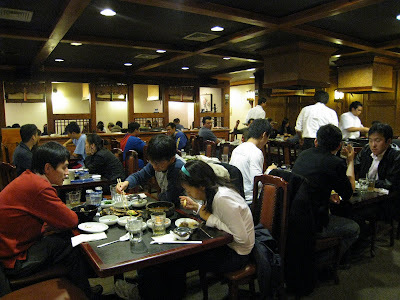 It gets really crowded in there, so don't be surprised if there is a wait at any time of the night. The portions are generous, and it's a great place to come with friends. I would recommend it if you're craving great tasting food especially after a night of drinking and dancing. 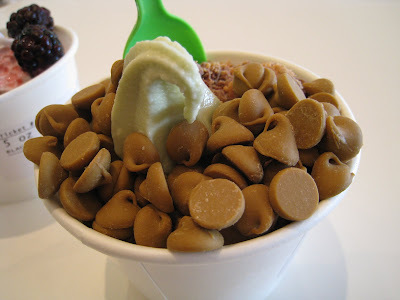 I finally checked out a frozen yogurt place since the PinkBerry craze happened. 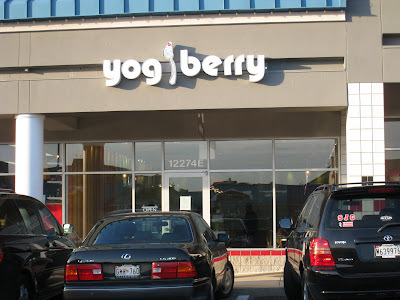 It is called Yogiberry, and is located in Rockville in Federal Plaza Shopping Center. The closest metro stop would be Twinbrook on the Red Line. Since it is located in a shopping center there is ample parking, however it was difficult finding parking since it was the weekend. The interior of the place is super trendy! I love the colors they use, and it looked kinda like an IKEA showroom with the plastic chairs, textured walls, and unique lighting fixtures. 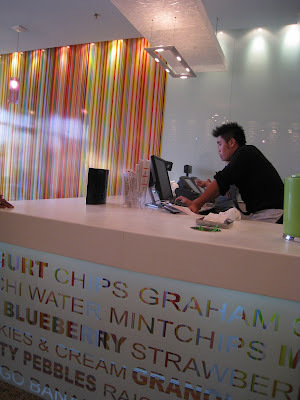 They used touch screen monitors for their registers, and was the 1st thing that you see once you walk in. The stipes on the wall were really different. This was the back of the place. It's really quite small with around 6 small round tables, some chairs and a long bench. I thought it had a modern, but cozy feel to the place. It has only been opened for a month, which explains the new and clean feeling to it. Let me mention how cool their floor was! It was made out of small pebbles. 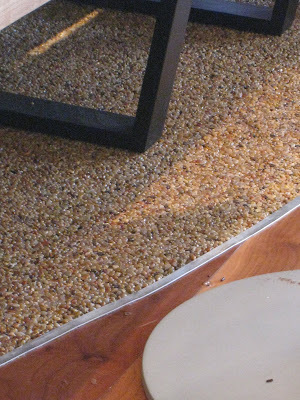 I think that helped bring a sort of 'zen' feeling into the space. -Original, Chocolate, Berry, Green Tea. All frozen yogurts are low-fat, however I can't say if any of the flavors are non-fat because I've been getting different answers. 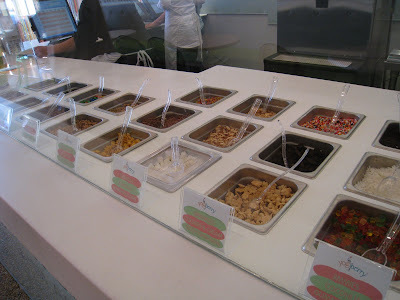 After picking a flavor you have the option of choosing toppings. You can get sweet toppings that range from Oreos to butterscotch chips, cereals like Fruity Pebbles and Cap n' Crunch, or healthy ones like raisins or granola. Each of them are $.95 each, but can change depending on the size cup you get. 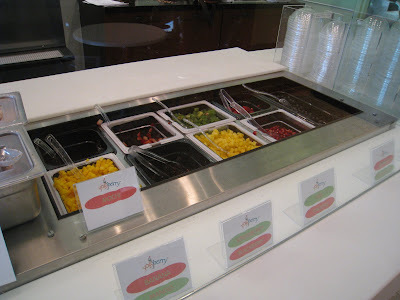 There are also fruit topping options like kiwi, mango, pomegranate, banana, etc. 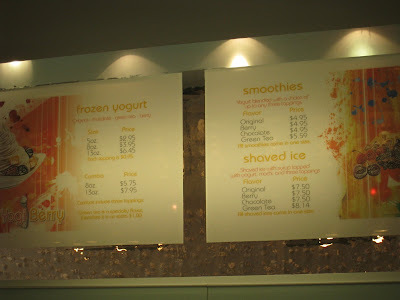 Besides ordering just frozen yogurt, you can order smoothies for $4.95 which include 3 fruit choices. 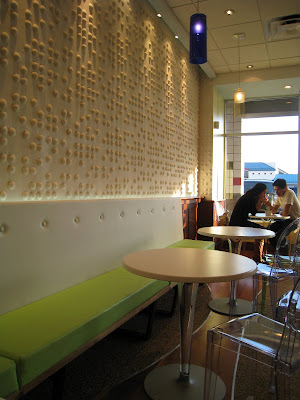 Or you can order 'shaved ice' which is the frozen yogurt on top of shaved ice with 3 topping choices, mochi, sweetend milk and syrup, which costs $7.50. 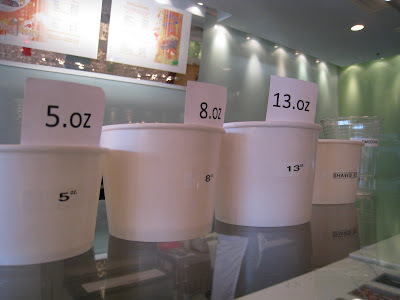 You have the option to combo the 8oz and 13oz, which gives you 3 toppings to choose from, and that changes the prices to $5.75 (8oz) and $7.95 (13oz). Also since the Green Tea flavor is special, add $1 to all the prices I've listed if you choose to order it. The staff there is super nice, friendly and helpful. They let me sample all 4 of their flavors. This picture is of their chocolate. 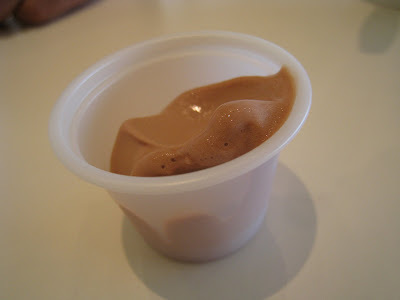 I actually didn't really care for chocolate since I like my chocolate rich in flavor, and it's difficult to acheive when it's low-fat, and yogurt. 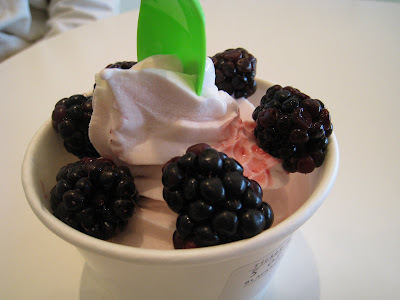 The bf ordered berry flavored yogurt with blackberries. I have to say that the berry flavored yogurt was the best overall. It tasted like real berries and the texture was light. 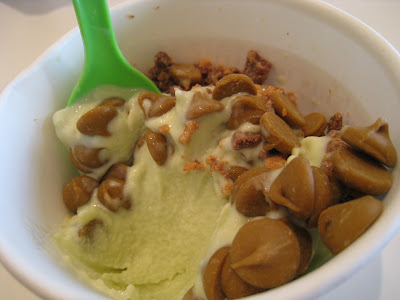 I on the other hand wanted to try something different and got the green tea frozen yogurt with butterscotch chips and reese's buttercups. Yes, it was a slightly odd combination, but I figured you can't go really wrong if you mix all of your favorite things. The green tea has a more sour flavor than the others, with chocolate coming behind it, then original, then berry with the least sour taste. It's not an over powering sourness at all, but yogurt does have a tanginess to it. It had great texture, and I'm glad it stayed frozen for a while and didn't melt fast while I was eating it. I highly recommend trying this place out. It's a low-fat treat, it's a cute place for friends to hang out, and the combinations are endless. It can be a bit pricey if you go overboard on the toppings, but if you bring in your student ID on Fri-Sat, you can get 10% off your purchase.